Start your trip to New York by touring the famous landmarks in Downtown Manhattan. After setting sail on a breathtaking State of Liberty Cruise, treat yourself to views of the illuminated city skyline on our Night Tour. 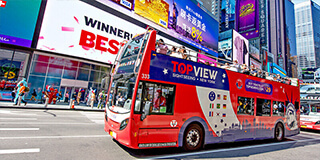 Start your NYC experience with an overview of the city! 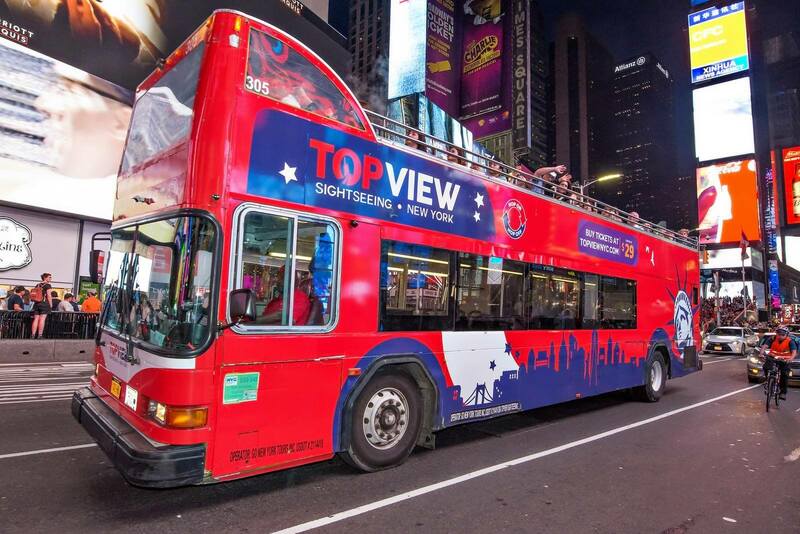 The Downtown hop-on hop-off bus tour is the best way to get a glimpse of what New York is about. With the state-of-the-art audio narration, you will learn as you pass by famous attractions: Times Square, Flatiron Building, Rockefeller Center, Union Square, and more. Hop off at any bus stop along the route, explore, and hop on the next bus to continue the tour. You will get a good grasp of what NYC has to offer and be able to find your way around in the next few days. Seeing the Statue of Liberty should definitely be on your list if you are visiting New York. 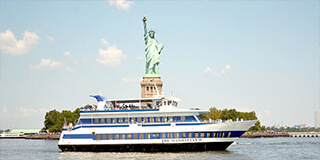 During the cruise, you will get close-up views of Lady Liberty, along with stunning sights of the Manhattan skyline. 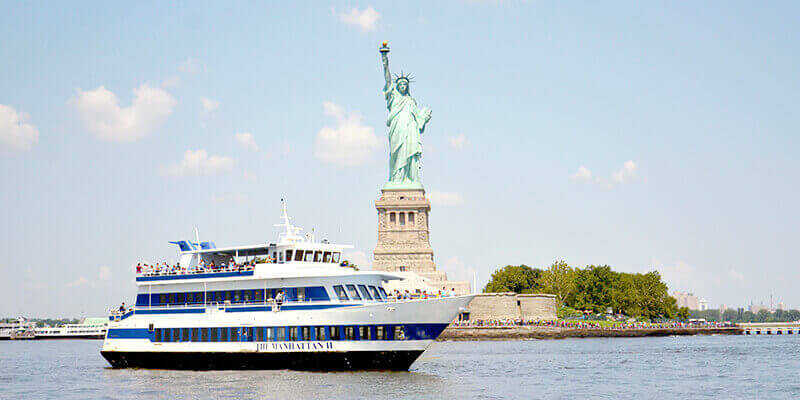 You will also see Ellis Island, Governors Island, Brooklyn Bridge, Manhattan Bridge, New Jersey, and more while on the cruise. 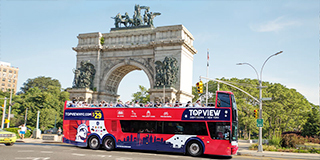 The experienced live tour guide on board will illustrate the history of the statue and New York City, making the tour fun and informative. Being called "The City That Never Sleeps", New York shows its glamour when night falls. On the Night Tour, you can sit back, relax, and enjoy the dazzling display of lights above the crowd. 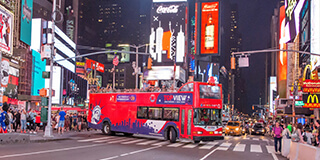 On the tour, Times Square, Chrysler Building, Grand Central, and other famous sites will reveal their beauty at night as the bus travels across New York City. 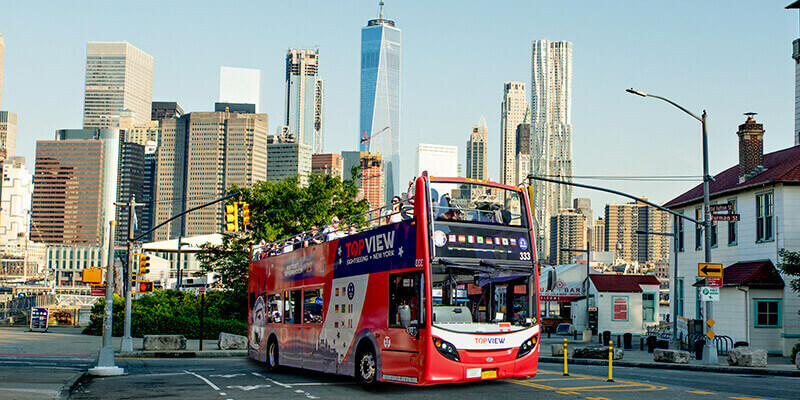 The bus will cross over to Brooklyn, from where you can take in the sights of the lit-up Brooklyn Bridge and the stunning Manhattan skyline. 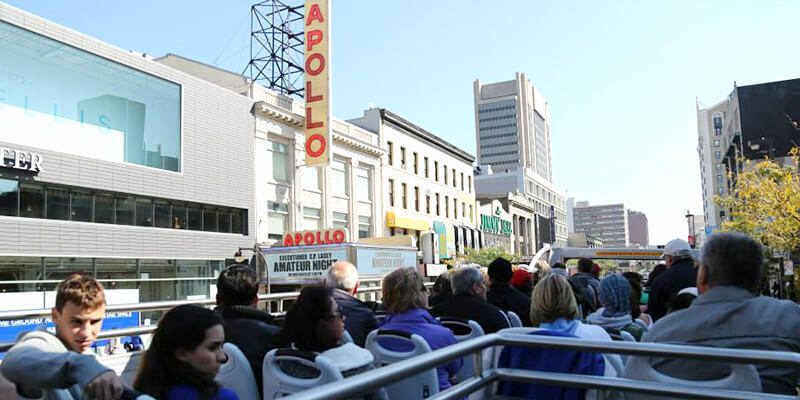 On Day 2, you’ll start by taking a tour of Uptown and Harlem. On your way back, explore the iconic American Museum of Natural History before taking in the bizarre exhibits at Ripley’s Believe It or Not! 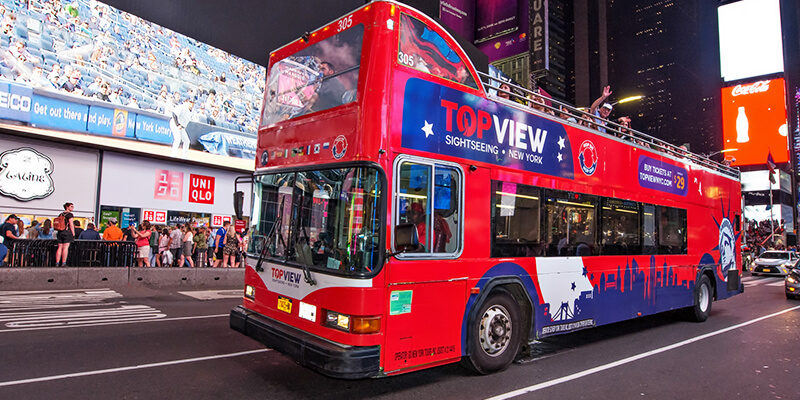 On Day 2, you can take advantage of the Uptown hop-on hop-off bus tour and discover the culture and nature of New York. Known for Central Park and the world-class museums, Uptown Manhattan is also home to Harlem, where the African American culture thrives. With GPS-guided audio narrations, you will discover the lesser-known facts of the attractions. 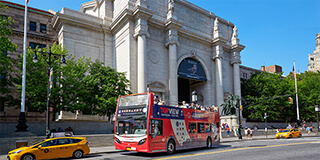 A few popular stops to hop off include: Columbus Circle, Dakota Building, Cathedral of St. John the Devine, Apollo Theater, and more. 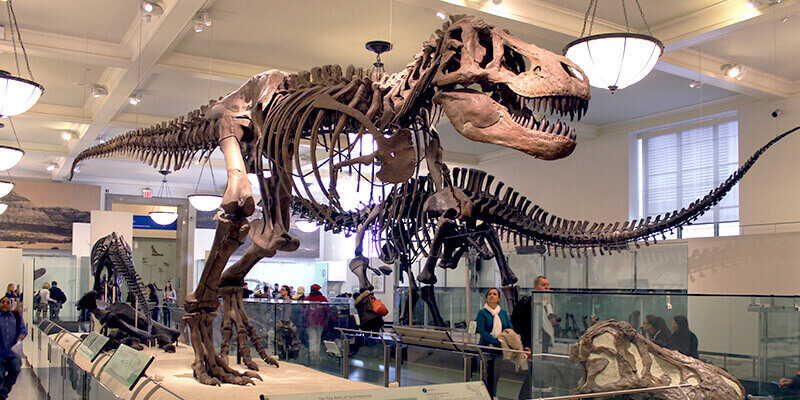 As you explore Uptown, don’t hesitate to pay a visit to American Museum of Natural History. Conveniently located at Central Park West & 79th St, locals and visitors alike consider this one of the city’s most essential experiences. 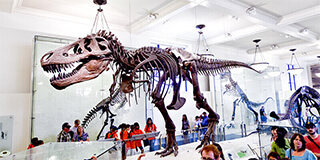 The incredible Tyrannosaurus Rex, Stegosaurus, and Barosaurus fossils are guaranteed to appeal to any dinosaur enthusiast, while vast exhibits and collections allow visitors to explore every corner of the earth, the oceans, and the space. Admission to this museum gives you the unique opportunity to learn more about mammals, reptiles, and the other life forms that inhabit our planet. 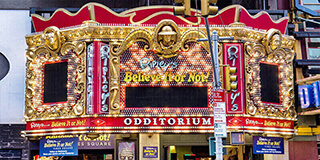 After you finish your Uptown & Harlem Tour as well as your museum visit, return to Times Square where Ripley's Believe It or Not! located. The odditorium is a fun spot to visit for adults and kids alike. 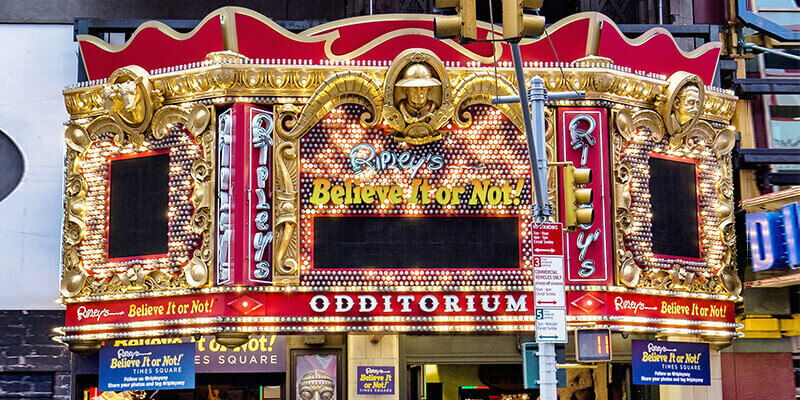 Featuring bizarre art and items, Ripley's has over 18,000 square feet interactive space where you can enjoy engaging and interactive activities. Get surrounded by stars in The Black Hole, or test your reflexes at Smash Dash, you will find the visit full of excitement. On Day 3, you can take a trip across the harbor to the popular borough of Brooklyn. After a leisurely 4-hour bike rental in Central Park, finish off your trip by visiting the Museum of the City of New York. Brooklyn is an indispensable part of New York with its unique culture and attractions. 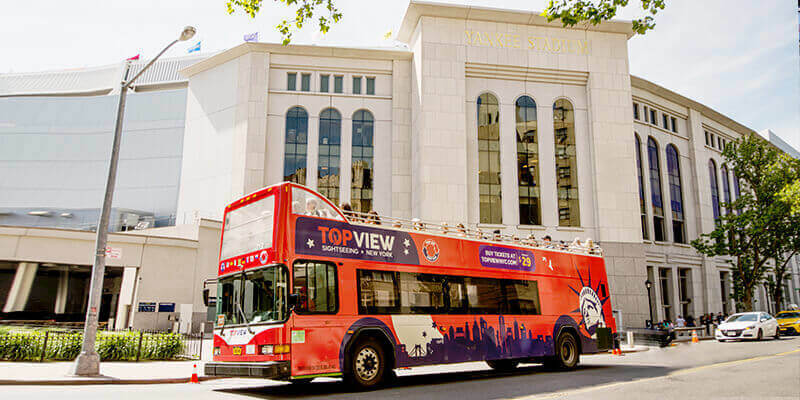 By taking a double decker bus tour, you can enjoy panoramic views of the famous Brooklyn attractions, including Brooklyn Bridge, Grand Army Plaza, Barclays Center, Prospect Park, Brooklyn Museum, NY Transit Museum, Antique Furniture District, Botanical Garden, Fulton Mall, and more. Learn about the history and stories of Brooklyn from state-of-the-art audio narrations. The tour starts and ends at Battery Park so you can continue to explore the Downtown area after the bus tour. After exploring Brooklyn, Central Park’s natural landscapes will certainly give you a different perspective of New York. Your 4-hour bike rental allows you plenty of time to take in all of the iconic sights that are unique to Central Park. The Bethesda Fountain, Sheep Meadow, Strawberry Fields, the Central Park Carousel, and more all make this 843-acres park one of the most unique and wonderful places in the city. Famous buildings like the Plaza Hotel and the American Museum of Natural History also surround the city’s expansive greenspace and are fun to explore at your leisure. End your incredible tour of the Big Apple by immersing yourself in nostalgia. 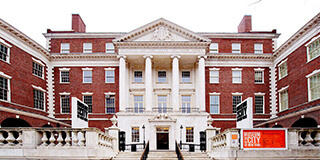 Located on New York’s famed “Museum Mile,” the Museum of the City of New York is a non-profit that invites patrons to join them on a trip back in time. The grand 5th Avenue museum houses galleries, exhibits, demonstrations, and multi-media displays that will walk you through the story of how the iconic city came to be. From authentic photos and historical maps to vintage clothing and furniture, the museum’s artifacts all create a captivating and comprehensive chronicle of New York City’s on-going journey.